You see that kid throwing silverware on the floor at the table next to you? That will never be your kid, right? Just give it a few months. You see that kid eating bread and butter for lunch and refusing anything else? What kind of mother is she to give her kid bread and butter for a meal? Just wait...your kid will stop eating that gourmet organic gluten-free stuff some day and will want nothing but bread and butter. You hear that kid screaming on the playground? Didn't that parent tell her that she shouldn't scream in public like that? Oh wait, that was my kid? who sleeps with their arms out like this? Oh...I am sorry. I fell asleep on my keyboard. Why? Because aliens have come down from planet Zorflack and replaced my 3.9 year old with some being that refuses to sleep longer than 2 hour increments, that for some reason at night cannot go to the bathroom by herself and now refuses to actually sleep in her own bed. My girls are great sleepers. That is something I have said out loud many times. Each of them slept through the night around 6 months old, without a hitch. M moved to her big girl bed shortly after she turned 2, without a hitch. Once she was potty trained (weeks after her third birthday) she began getting up once or twice during the night to use the potty. That is fine. My husband and I got in a pattern of alternating nights of getting up with her, so that one of us could get a good nights sleep. We had a good thing going. This past summer she pretty much dropped her afternoon nap, and started going to sleep around 7:30. Most nights that she didn't nap she actually slept through the night, or just got up once. But oh those days are gone my friends. - Can I sleep with you? - Can I sleep in the guest room? After I have gotten up with her 2-3 times (and the clock is still in the PMs) I give my husband the elbow to signal he has been tagged in. I need sleep people. And the last few days I have been sick so I need my sleep even more. Not getting a good night sleep for this Mama equals Crankypants McGillicuddy (a close relation to Judgy McJudgerson from my last post). So when she gets up and comes down the hall we instruct her to go to the potty by herself, to which she always replies "I can't." This is not the truth, as she goes all day long by herself. No matter how much we have lit the path to the bathroom, she refuses to go unless one of us is with her. We don't help her, we just stand at the door of the bathroom, then watch her walk back into her bedroom and get in bed, then we close the door to her bedroom. She has this thing about not being able to go into her own room, close the door on her own and then get into bed on her own - no matter how well lit her bedroom is. But lately in addition to the going potty, and other special requests, she has often been telling us that she doesn't want to be alone in her room. When we she goes to get back in bed she starts screaming for us to stay in the room. You want your heart to be broken? Come to our house and watch M scream and cry from her bed, with arms reaching towards you, "don't leave me! You can't leave me in here alone!" We have tried laying in there with her until she falls asleep, but it is impossible to escape without her hearing us. We have tried leaving her in there crying her eyes out, but she won't fall asleep, and we can only take too much of that "wait it out" torture. 1. 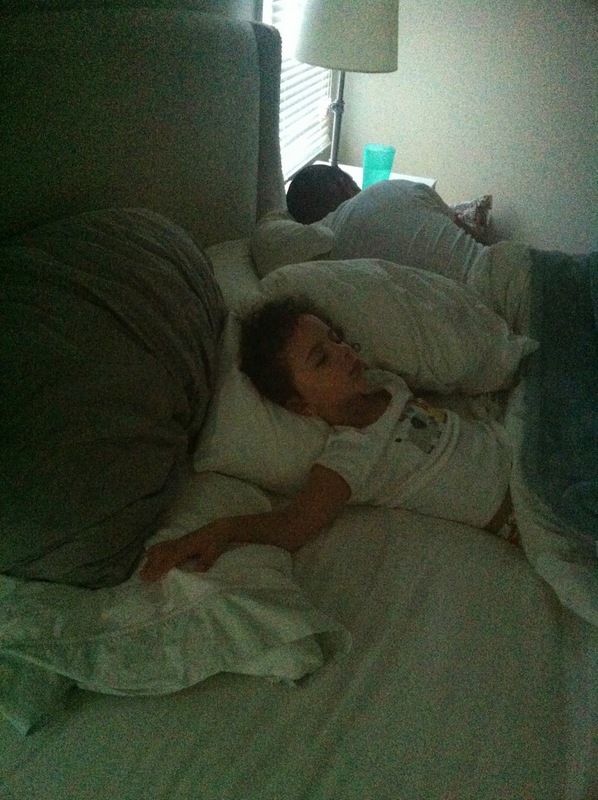 We put her in the guest room half way through the night, where there is a big comfy king bed and lots of pillows. She still ends up getting up a few times after that, but doesn't fight going back to that bed. 2. We put her in our bed. And she sleeps soundly until I wake her up in the morning. WTF??? She sleeps soundly? Last night my husband got up with her once, and then instead of fighting with her just put her in our bed the second time she got up (around 11 PM). The girl who normally wakes up at 6 AM at the absolute latest had to be waken up at 7:30. The day before she ended up in our bed around 2 AM and had to be woken up at 7:45 AM. HUH? You know who isn't sleeping soundly? Everyone else in our bed. M sleeps with arms out, knees in my back, breathing in my face, snoring in my ear... it is like sleeping with a Great Dane between my husband and I. We have slept many a night these past 7.5 years with a dog in our bed (which I loathe as well) and seriously I would take the dog over the child. The dog goes to her own bed when I nudge her with my feet. I cannot say the same for the child. I am not sure what has spawned this behavior. If we look at the time frame, M's sleep patterns have gotten much worse since she started at her new school. She seems to be really happy at this new school, and I have a warm and cozy feeling about everyone there. Hubs did some research and he discovered that when a child goes through a major life change (in this case a brand new school) it can affect their sleeping behavior. Did she have a bad dream where something happened to her in her room? Sometimes she tells us that she did have a bad dream, but only if we ask if that is the case. Our sweet M is a little on the dramatic side, so it is hard for me to know if she is telling the truth about having bad dreams, because she could just be acting out something she saw on TV. But what should we be doing? Should we be giving in and letting her sleep in a different room? Should we not allow her in our bed at all? How do we know if she is just playing with us? I long for the days of 7-8 hours of uninterrupted sleep. I am so jealous of my friends who have kids that sleep through the night, and sleep past 7 AM. Hear that universe? I would love some advice from you all. If you have ever gone through something similar please share your story! Ugh. That sounds horrible. I have no personal experience (and am crossing my fingers that my 3.9 y.o. girls don't suddenly start with this!). What about talking to Teresa or one of the other Isis gurus?